Your home will never look spookier with these clever and creative DIY decor ideas. Transform your inviting abode into a haunted house or simply add some festive touches to a room. Continue to 2 of 63 below. Grab some empty toilet paper rolls and a bag of LED tea light candles to recreate the floating candles from Harry Potter with this clever DIY from Eating Bender that will leave everyone who sees it spellbound. Continue to 3 of 63 below. Decorate your mantel or coffee table with a cluster of your own handmade apothecary jars that will leave everyone curious to read the labels and see what is inside the curious bottles. Continue to 4 of 63 below. Cover the outside of your house, trees, or even walls with these easy to make DIY yarn spiderwebs. Continue to 5 of 63 below. Make a spooky first impression when people visit your door this Halloween with DIY magnetic spiders that us affordable plastic bugs that can crawl across your door. Continue to 6 of 63 below. Go glam this Halloween and add a bit of glitter to your decor by making your own super simple to make glitter skull. Continue to 7 of 63 below. Wrap up some styrofoam cones to make these cute candy corn decorations to use within your home. Continue to 8 of 63 below. Give the illusion your home is a wizards or witches home by displaying these DIY mercury glass potion bottles this Halloween. Continue to 9 of 63 below. Enhance your stairwell or any wall within your home with a swarm of paper bats. Continue to 10 of 63 below. Create realistic looking weathered tombstones to create a cemetery on your lawn with this DIY that the whole family can work on together. Continue to 11 of 63 below. Skip the fire hazard of using real candles by transforming battery operated tea light candles to look like dripping black pillar candles. Continue to 12 of 63 below. Add some floating ghosts to your Halloween decor by making them with inexpensive cheesecloth. Continue to 13 of 63 below. Recover books in minutes to look like ancient spell books with printable spell book covers to stack in bookcases or on mantels. Continue to 14 of 63 below. Cut out mouse silhouettes from black cardstock to give the illusion that your home is infested with rodents. Continue to 15 of 63 below. Embellish your windows or door frames with spiderwebs made out cutting trash bags. Continue to 16 of 63 below. Deck out your Halloween party table with this spooky DIY spider web table runner complete with dangling spiders on the side. Continue to 17 of 63 below. Add some humor to your Halloween decor by making tombstones with funny messages on them. Continue to 18 of 63 below. Adorn your windows with hanging candy corns that Trick-or-Treaters can see when they visit your home. Continue to 19 of 63 below. Head to your local consignment store and pick up old vases and urns and paint them with spider webs to decorate the interior of your home. We suggests using several clustered together on your fireplace mantel, or filling the spider web dishes with candies to serve to guests. Continue to 20 of 63 below. Accessorize your sofa for Halloween with this skull and cross bones pillow that you can easily make. Continue to 21 of 63 below. This cute DIY ghost garland is made out of patio lanterns and is perfect for illuminating the path to your home or your front porch. Continue to 22 of 63 below. Get ready for Halloween by making some pumpkin candle holders that will look amazing in your home by filling mini plastic pumpkins with cement. Once complete the mini cement pumpkin candle holders would look amazing with black or orange candles on a table in your home. Continue to 23 of 63 below. Enhance regular cups or even plastic cups for your Halloween celebrations by using thin black tape on the bottom of the cups to create a creepy web pattern at the bottom of the glass that will make every beverage you serve on Halloween seem extra fancy. Continue to 24 of 63 below. 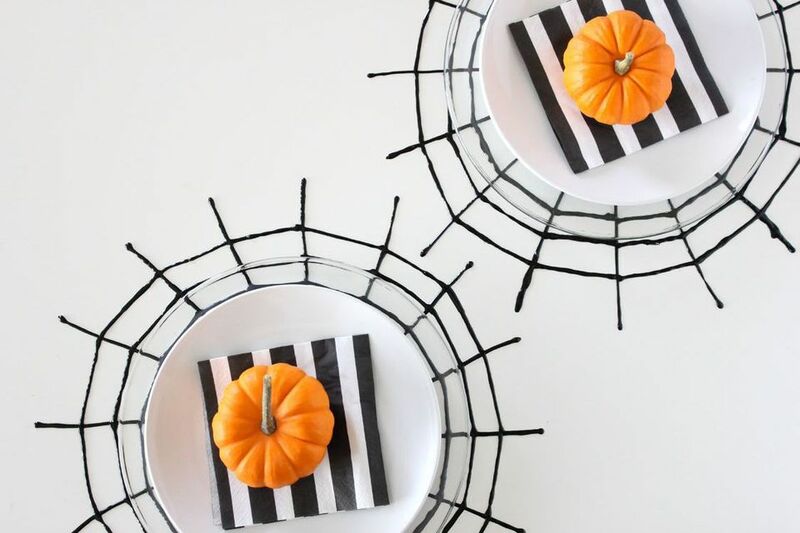 This simple to make DIY is perfect to do as a family, by painting thin lines of black puff paint over a large web pattern your family can create their own spooky spiderweb placemats to go where they sit at the dining room table this Halloween. Continue to 25 of 63 below. Even if the people at your Halloween party are too old to go trick or treating, chances are they will still want to get candy. One fun way to give out small pieces of candy to everyone is making a ghost pinata that will keep guests entertained as they take turns trying to break the pinata to gain access to the candy inside. Continue to 26 of 63 below. If you are looking for some quick Halloween decor this printable trick or treat banner is perfect, all you need to do is print the candy corn colored letters and string them together on a piece of twine to create your own banner that you can hang up. Continue to 27 of 63 below. Skip buying expensive Halloween-themed paper plates for all your guests to use at your Halloween party but instead buy regular black or orange paper plates which you can decorate on the sides of the plate with paper to make them look like a bat, pumpkin or spider. Continue to 28 of 63 below. Instead of candy, send the adults at your Halloween party home with a stylish mini rose gold pumpkin planter for them to bring home with them with this quick DIY. Continue to 29 of 63 below. Make your own creepy cocktail stencils to add a raven or spider design to the top of your cocktails or even latte this Halloween. Continue to 30 of 63 below. Begin transforming your home into a haunted mansion for Halloween this year by adding a spooky bones display to a side table in your home. By using plastic bones from part of skeletons that are sold at Halloween stores you can repurpose the bones to present them in a new and unexpected way this Halloween in a few easy steps. Continue to 31 of 63 below. Craft these cute pumpkin swizzle sticks that are perfect for Halloween and Thanksgiving out of wood round beads and 6" dowels to give all the beverages you serve this Fall some extra flare. Continue to 32 of 63 below. For an expensive decorating idea add some bleeding candles to your home, that you can make by dripping red candle wax over the top of a regular white candle. Continue to 33 of 63 below. For fun, more child-friendly Halloween decor, these DIY spider balloons are perfect as they not very scary. For some amazing party, decor covering the ceiling of one room with helium-filled balloons with sparkle hanging spiders that hang just above everyone's heads. As the kids leave your party, make sure to send each child home with their own spider balloon and some candy for a great party favor. Continue to 34 of 63 below. There is nothing like a little competition to get everyone excited for your Halloween party this year. When inviting your guests this year to your Halloween party let them know in advance there will be a costume contest, and if you wish you can let them know what the awards will be given for. Prior to your party using plastic skeletons you can make the costume trophies for things like best costume, best couples costume, most original costume etc, which can be handed out at your party once the winners have been selected. Continue to 35 of 63 below. Temporarily change your home's decor leading up to Halloween to add a subtle eerie feeling by hanging some spider plates, which can be made in minutes using white plates and window clings. Continue to 36 of 63 below. Cover regular white helium-filled balloons with a sheet of tissue paper and then draw a face on the tissue paper to form a floating ghost perfect for Halloween. This original idea would look great at a party, or tied to weights and left floating on your porch to greet trick or treaters on Halloween. Continue to 37 of 63 below. If you are hosting a Halloween party having a candy bar is essential so that guests can help themselves to their favorite sugary snacks all night long. Instead of just filling multiple bowls with candy, one creative way to present sticks of candy is to have them sticking out of multiple foam pumpkins. The creative presentation will impress your guests, and makes for a great centerpiece for your food table too. Continue to 38 of 63 below. Help your family warm up after trick or treating outdoors with a warm of warm apple cider or hot cocoa in a festive jack-o-lantern themed mug by making your own cup decals which you can temporarily stick on any cup on Halloween, such as stylish copper mugs. Continue to 39 of 63 below. Before you go out trick or treating as a family, have a fun spooky themed dinner by decorating the dinner table with homemade pumpkin place cards that can be made by using mini pumpkins and decorating the tops of each pumpkin with paper silhouette shapes that has each person's name written on them. Continue to 40 of 63 below. This Halloween bake a batch of black velvet cupcakes to bring into the office and decorate the tops of the cakes with vanilla frosting and some printable cupcake toppers with spiders and ghosts. To save time before on Halloween morning before you go to work, pre-assemble the cupcake toppers and store them in a small bag before adding them to the cupcakes once you arrive at work. Continue to 41 of 63 below. Give you home some extra curb appeal this Halloween by decorating the exterior of your house with Halloween decor, such as hanging a homemade wreath made out of plastic skeleton hands which looks amazing hung on a front door. Continue to 42 of 63 below. Are you hosting a spooky themed Halloween soiree with your adult friends? Help them find their seat at the dinner party with some metallic pumpkin place cards that will help to add some spooky ambience to your home. Continue to 43 of 63 below. Get ready for Halloween by making some adorable ghost bottles by recycling old bottles and giving them a new look by painting the exterior. Then on Halloween, you can serve drinks to your kids, such as pumpkin colored orange soda or "ghostly" white milk as part of their after-school snack. Continue to 44 of 63 below. Mix up your own custom Halloween drink this Halloween, such as a green slime lemonade, and garnish the drink with a white and black spider straw that you can prepare in minutes as the kids are getting their costumes on. To make your own DIY spider straws grab a pack of plastic spiders and black and white paper straws at the store and read the tutorial at Sarah Hearts on how to assemble the straws and mix together your own green slime lemonade. Continue to 45 of 63 below. Quickly create a grouping of creepy skull candle holder that will illuminate a skull design. To make your own skull votive you will need: small glass candle holders, tea light candles to go inside the holder, and vellum paper to print the skull design onto. After you have printed the design simply wrap the vellum around the candle holder and you will have an easy knock-off of the Pottery Barn skull candle holders. To download the skull template to use on glass candleholders and to read the full DIY instructions visit Monica Wants It. Continue to 46 of 63 below. If you decided to provide some variety on Halloween and will be serving either cupcakes or cakes in addition to more traditional Halloween candy you can dress up a plain homemade or store-bought cake by making your own eek cake topper that can be cut out using your Silhouette machine and stuck into the top of a cake. To learn how to create your own eek cake topper using a Silhouette machine visit Handmade Mood to watch the instructional video. Continue to 47 of 63 below. Create a vampire-themed Halloween party by decorating some inexpensive second hand or dollar store glasses with red craft paint to create custom dripping blood glasses perfect to serve drinks in all Halloween night long. To learn how to dip your glasses in red acrylic paint to get the perfect bloody drip marks in no time at all read the wonderful tutorial at Almost Makes Perfect. Continue to 48 of 63 below. Take regular white plastic skulls available at the dollar store and transform them into decorative chalkboard statue by adhering them to a​ candlestick holder and painting them with chalkboard paint. This simple to make decorative skull would look amazing as an accent on your bookcase, a fireplace mantle or clustered together with varying heights of chalkboard skulls on a kitchen table. Continue to 49 of 63 below. Make your own set of Halloween party cups by dressing up inexpensive orange paper cups with vinyl that can be stuck directly onto the cups. As a fun activity for guests on Halloween provide a variety of pre-cut Jack-o-lantern eyes and mouths so that everyone can create their own signature face on a cup which will also help them easily identify their drink throughout the night. To download the Jack-o-lantern faces that can be cut out of vinyl, and to read the full DIY details on how to make your own DIY Halloween party cups read the full tutorial below. Continue to 50 of 63 below. If you find yourself on the morning of Halloween without a Jack-o-lantern ready, fear not you can quickly make a stunning pumpkin without carving by downloading this trick or treat template that you can cut out on vinyl to peel and stick your design right onto your pumpkin, and your beautiful trick-or-treat pumpkin will be done. Continue to 51 of 63 below. Frighten your family on Halloween by serving up dinner on some handmade spider plates that are made by using a spider stamp to create the design. Best of all when Halloween is over you can easily wash away the stamped spiders and re-use the glass plates year round, or stamp them with a new design. Continue to 52 of 63 below. Light up the interior of your home on Halloween night with a stunning handmade DIY boneyard lantern that is made by gluing small plastic skulls onto a glass vase. The end result is a spooky vase covered in skulls, each skull having glowing eyes to light up your home. Continue to 53 of 63 below. Take a regular plastic skull that is available around Halloween for a few dollars and turn it into a chic skull vase that is perfect to use year round in your home with just a coat of paint. Continue to 54 of 63 below. Set the table on Halloween with some super cute hand-stiched ghost napkins that can be made by using white thread to outline a ghost on a black napkin. Continue to 55 of 63 below. Make your own sophisticated mercury glass pumpkin that is perfect to dress up your home for Halloween and Thanksgiving. Continue to 56 of 63 below. Decorate your home by carving a few white mini pumpkins to look like vampires and add a red candle to the top of each to resemble dripping blood for a creepy centerpiece this Halloween. Continue to 57 of 63 below. Add a big boo sign to your home to decorate your home for Halloween. This fun sign is made using cardboard letters as the base, and is decorated with orange, black and white gumballs. Continue to 58 of 63 below. Transform a regular leftover bottle that you would have tossed into the recycling bin by decorating it to look like scary apothecary potion bottle with a bit of paper mache and a small plastic skull. Continue to 59 of 63 below. For kids, and even some adults Halloween is all about the candy, so why not create a playful sign that says that to decorate your home. Continue to 60 of 63 below. After your children have returned from Trick-Or-Treating have a fun-filled activity waiting for them that will give them even more candy. With your free time one evening, assemble a cute spider pinata to use on Halloween so that everyone in the family can take turns having fun swatting the spider until it breaks and spills candy all over the floor. Continue to 61 of 63 below. Quickly transform any drink into a Halloween themed one by cutting out paper bats that can be slipped onto straws for a quick DIY the kids will love. Continue to 62 of 63 below. For Halloween create a festive doormat to dress up your home's exterior to let your neighbors know you will be giving out candy on Halloween. This super easy stenciled boo doormat is the perfect spot for kids to wait for candy while they ring your doorbell, and it is affordable to make too. Continue to 63 of 63 below. Toss this handmade wicked pillow onto your sofa for Halloween as a quick way to decorate your living space. The printable iron-on transfer design can be found below and ironed onto any blank pillow.